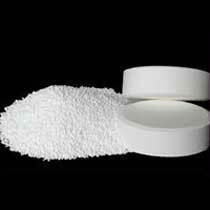 We have carved a niche as the leading Swimming Pool Chemicals Manufacturers from India. Our range of Swimming Pool Chemicals is highly effective and it helps in maintenance of hygiene in the swimming pools. Besides, it can also be availed at the most affordable prices. SODIUM DICHLORO ISOCYANURATE (SDIC) : SDIC is an external broad-spectrum disinfectant, bactericidal, algaecidal deodorant, widely used in the disinfection and sterilization of swimming pool. It can be availed in granular, powder and tablet forms. ACUROCIDE 50 (Algaecide) : ACUROCIDE 50 (Algaecide) is a safe, rapid acting Algaecide widely used as a combination sanitiser-disinfectant for swimming pools. CYANURIC ACID : Cyanuric Acid is a chlorine stabilizer that protects chlorine from the negative effects of UV as well as heat. It not only ensures that our pool remains clean and safe for the swimmers throughout the day, but it also reduces the amount of chlorine we need to add in order to maintain these levels of disinfection.